Unsecured business loans are only one way of obtaining financing for your company. They happen to be the least difficult to receive approval for, though it wasn’t always like that. In the past, most businesses applied for secured business loans, using the company’s assets for collateral. After multiple economy crashes, the banks were left with assets from many small businesses. These companies were worth nowhere near the amount that was borrowed. Now, they are no longer willing to assume the risk: they want the business owners to step up and share it. Here’s the thing, though. The whole point of forming a business entity is to protect yourself from creditors coming after you for company debts. What happens if an incorporated business or limited liability company goes bankrupt? Its owners are not liable for any debts of the company after the assets are sold off. Except for unsecured business loans that are personally guaranteed. 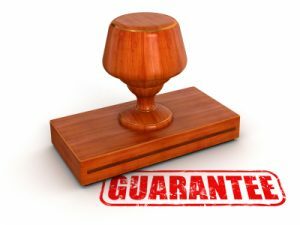 So is a guarantee required for unsecured business loans? Well, yes, but… First let’s look at exactly what a personal guarantee entails. You are asking for a loan, and you are guaranteeing that you will pay back the entire thing. If your business folds, whoever’s signature is on the loan documents will be expected to pay that loan back. You will probably be able to come to some arrangement with the bank to make payments, but you are on the hook for the loan until it is paid off. Now keep in mind, it’s not always a yes or no option. As with all types of financial matters, there is going to be some give or take when it comes to lending negotiations. For the most part though, you’re going to need a personal guarantee when it comes to most types of small business loans. Now let’s look at some of the alternative scenarios. Credit Cards: If you max out your personal credit cards to fund your business & the business folds, you still need to pay off those cards. Second Mortgage or Home Equity Loan Again, you will have to pay those off or lose your home. Borrowing from Family & Friends: This is harder than losing your home or declaring personal bankruptcy due to credit card debt. You will have taken money from people who believed in you, and only wanted to help you. You can’t cut all of them out of your life because you can’t pay them back. So a personal guarantee to a bank is not actually the worst thing in the world that you can agree to. Whether borrowing the money from a bank or using other means, you will need to be smart about it. Most companies in our directory of online lenders have specific instructions about these types of clauses. The question remains, should you get a small business loan with this requirement? It’s never going to be a simple yes or no answer when it comes to difficult financial questions. If you have gone through your options and financial alternatives you should know where things stand financially. Assuming you’re at this point, there is no reason why you shouldn’t, as long as you follow a few guidelines. Only borrow what you can afford to lose: Like with gambling, you don’t want to risk your retirement fund, college savings or your home. Look at the worst case scenario and be realistic about what it will take to deal with it. Even if you are confident about your business skills, life has a way of throwing curve balls. Hope for the best, but prepare for the worst. Spread the risk, if necessary. Unlike banks or payday loan companies, The Small Business Administration requires guarantees. These can be from anyone who owns a 20% stake or greater in the company before it approves a loan. But there is no reason for you to place restrictions. Are there other owners, or people who will share in the profits? Then have them share the risk. Each owner or principal should guarantee the same percentage of the loan and the share of profits they would receive. So, yes, you will probably have to give a personal guarantee. But there are worse things that you can avoid, as long as you’re smart about it. With Unsecured Business loans most applicants are generally asking for tens of thousands of dollars and more. There is often considerable risked placed on the lender that’s actually coming up with the cash. In most cases it’s understandable that lenders will tend to ask for a personal guarantee.